Once upon a time a little girl sat in her mother’s arms and listened to the methodical voice of her mother reciting the tale of a girl who painted clouds in the sky, became a librarian to help others find their adventures, saw far away places, and came home to live by the sea. However, the woman’s grandfather told her there was one thing she must do… she must do something to make the world more beautiful. This courageous woman ignited the girl’s imagination. She, too, wanted to climb mountains and meet the Bapa Raja. She, too, wanted to ride camels and live by the sea. She, too, wanted to plant lupines along the hills and have the neighborhood children call her the lupine lady. It never occurred to the girl that Miss Rumphius did all of this on her own. But it occurred to the woman. I looked at my life at 28 and realized that all of the typical dreams of young girls did not come true. That little girl who sat on her mother’s lap had dreamed of fairytale weddings and handsome princes. She had carried around baby dolls pretending to be a little mommy. But she also carried around a briefcase just like her mommy and had a daddy who saw score boards light up with her name in her future. She had a grandmother, who she loved more than anyone in the world, with no filter and aunts who made names for themselves in their businesses and bought $1000 purses. And she had Miss Rumphius. So at 28 she realized that she wasn’t the wife and mommy type. At 28 she realized what made her happy was traveling and meeting people. At 28 she realized that she was stuck in the suburbs without suburb accessories. At 28 she was ready to be Miss Rumphius. She had already painted the metaphorical clouds with her family. She became a teacher to help others find their path in life. It was time to see far away places and live by the sea. Montevideo, Uruguay offered that option. Miraculously getting a job at the Uruguayan American School (let’s be honest, she didn’t even know where Uruguay was when they contacted her), she put her life in five suitcases, a backpack, and 18 boxes and set off to live in this far-away place that happened to be by the sea. She was nervous and scared, but she was also excited and prepared. Two days before she left, her grandmother passed away. It felt like a hole was ripped from her heart, but she knew that her grandmother would be with her as she made her way to her new adventure. So here she now sits…a beer for courage, a phone for connection, a passport for entry and a dream in need of fulfilling. 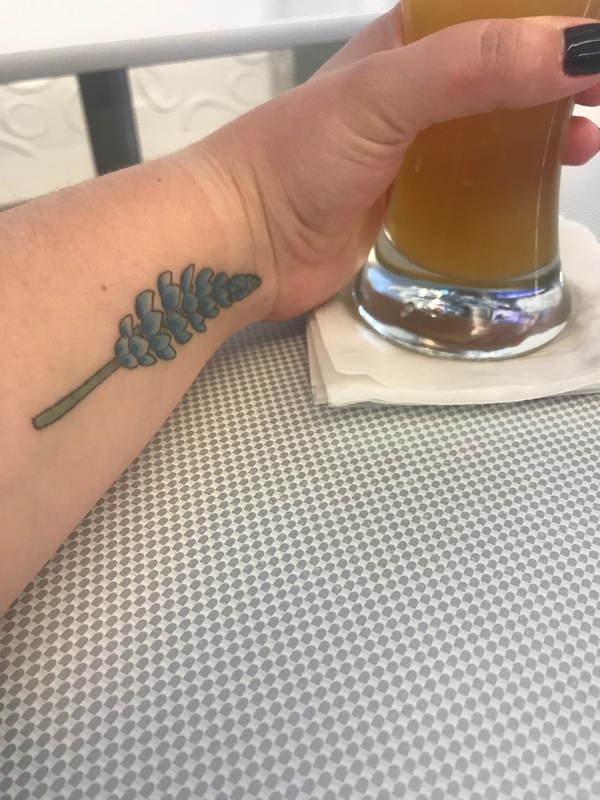 Here she sits with a lupine on her arm ready to make the world a more beautiful place. This is absolutely beautiful. 💗 so proud of you! Dear Kim, loved this! Send address and who knows? An old retired friend will definately study the geography of Uraguay with a wistful eye! Love you! Mrs. Shrum. P.S. My book has begun 51 – pages so far- wish me luck! 51 pages! That’s amazing! I can’t wait to read it! I’ll send my address when I officially get one. Love you back!